What is the Creative Case for Diversity? Arts Council England sets out what it means by the Creative Case for Diversity and shares diversity and equality data. Director of Diversity at Arts Council England, Abid Hussain, talks personally about what embracing diversity means for people and why giving a voice to communities, audiences and the workforce is important. The video was presented as a keynote at Creative New Zealand’s Nui te Kōrero on 7 June, 2017. Highlights, key notes and speakers from Arts Council England’s annual event discussion diversity in arts and culture, 15 January 2018. Guidance documents for National Portfolio Organisations, including monitoring prompts outlining how organisations’ contributions to the Creative Case for Diversity will be monitored. Cat Hammersley, Senior Manager, Data Analysis and Reporting, blogs about they collect diversity data from our funded organisations and projects – and more importantly, why. Diversity Director Abid Hussain blogs about his own experience of class and social mobility, and ACE’s social mobility measurement pilot with the University of Leeds and the AHRC. A toolkit guided by best practice recruitment principals and explores how you can think about developing a diverse workforce and leadership. It contains case studies and best practice examples from the arts and culture sector and beyond, with guidance on how to recruit and support diverse talent in an organisation, and how to capture and use diversity data. Bill Griffiths, Head of Programmes at Tyne & Wear Archives & Museums shares his thoughts on the meaning of the Creative Case for Diversity in a museums context, following the 2016 announcement by Arts Council England that museums would be part of the National Portfolio funding structure. Presentation by Bill Griffiths, Chair of Creative Case NORTH as given at the opening of CCN events in March & April 2018. The presentation provides an outline introduction to CCN and the Creative Case for Diversity, setting the seen for further focused conversations. 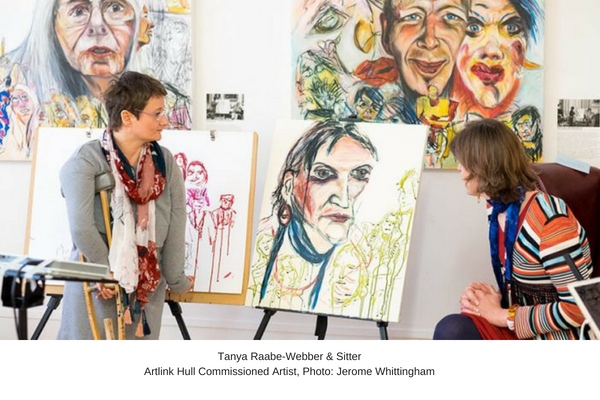 Disability Arts Network is organised by Artlink Hull and open to all interested in art, culture and disability. The network meets bi-monthly, and their website includes links a range of useful resources including the Shape Arts Accessible Curating guide, the National Register of Access Consultants, and the Elephant In The Room Access Guide. In the ten years at Sadler’s Wells, Alistair Spalding has been instrumental in changing the way the organisation is seen, understood and enjoyed by a diversity of audiences old and new alike. Through associates such as Jonzi D and Akram Khan, Sadler’s Wells has presented a programme of work that is representative of society’s lived experience. Hassan Mahamdallie, Senior Officer for Diversity at ACE reflects on how historically, the most powerful and striking art movements have come directly from the experience of oppression, diversity and inequality. Ian Ritchie has always been interested in ‘orchestras fit for purpose for today’s society’ through his Directorship of City Of London Festival and the commissioning of a new work by Nigel Osborne with Clarence’ Adoo’s Headspace ensemble and Skoog technology. In 2011 Mark Robinson, former CEO of Arts Council North East, alongside Tony Nwachukwu from burntprogress provided one of the most compelling pieces of research and thinking in the Creative Case approach exploring diversity’s relationship to the notion of Adaptive Resilience. Two years on, Mark considers Adaptive Resilience, the remix and how Diversity at the core of our operations and thinking makes us more resistant in times of change. Nazli Tabatabai-Khatambakhsh is a dual national writer, performer and Artistic Director of ZENDEH based in Newcastle, born in Iran. She describes the Creative Case as a beautiful piece of inspiration. She sees the approach as a means to galvanise her thinking around the business case for diversity. Sandy Nairne, Director of the National Portrait Gallery talks about the new acquisitions of work that wouldn’t historically have been allowed to take their rightful place and shares that this is just one way an organisation can reflect the Britain it wants to connect with. Chevalier d’Eon was one such example the first acquisition by the National Portrait Gallery in 2012. When Sarah Holmes restarted the New Wolsey Theatre in Ipswich with her partner Peter Rowe, she did so knowing that she wanted to create a place that everyone could access without permission or concession and that the key to this was creative collaboration with a diversity of partners including Graeae Theatre Company. Skinder Hundal, CEO of New Art Exchange returned to Nottingham to take the helm of the New Art Exchange because he remembered what the place meant to him as a young volunteer at the same organisation in the early 90’s and how it changed his life.